I am thrilled to become part of Candlelighters NYC and wanted to share my experience thus far. I recently saw a local TV spot highlighting the group and was incredibly moved. I immediately knew I was ready to jump right in to the organization. Candlelighters mission is to help families through tough times when their child is diagnosed with cancer. Candlelighters helps families from all over the country coming in to NYC. Barbara Zobian, the founder, is an absolute rockstar. In a city that can be overwhelming in itself the group provides emotional support, visits, special events or even things as simple as errands. It is a small group that accomplishes quite a bit. The first pic is of my new friend Jojo who was going home to Florida that day from treatments (and of course the Candlelighter's mascot Uno.) 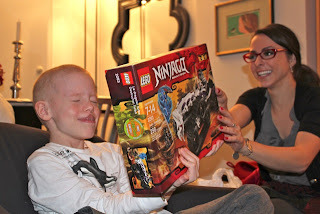 The other is with a Lego mastermind named Cole who had a great time playing the close-your-eyes-open-your-hand-for-a-surprise game. I truly encourage you to learn more about the organization. You can click here for a recent news segment or here for the website. If you are in the NYC area and just want to donate something as small as a toy please shoot me a line! No matter how busy you are... you can always find time. Be compassionate, be inspired. Hey, thanks for posting about this organization, I am interesting in learning more about it.